Nine days after this hike, I hiked over the Sawtooth Ridge and across Cottonwood Creek Basin to Cottonwood Creek Springs and Cottonwood Creek Falls, as described HERE. 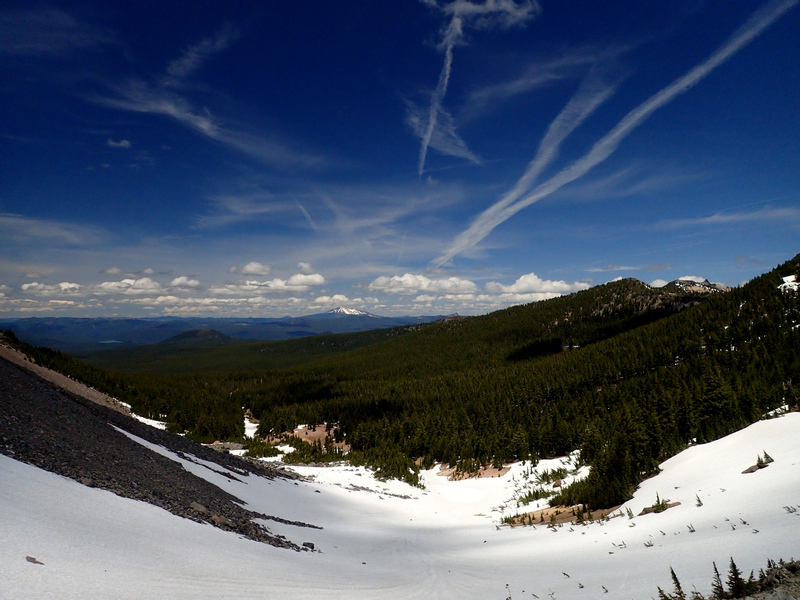 The 55,151 acre Mount Thielsen Wilderness runs along the crest of the Cascades from the southern end of the Oregon Cascades Recreation Area to just north of Crater Lake National Park. 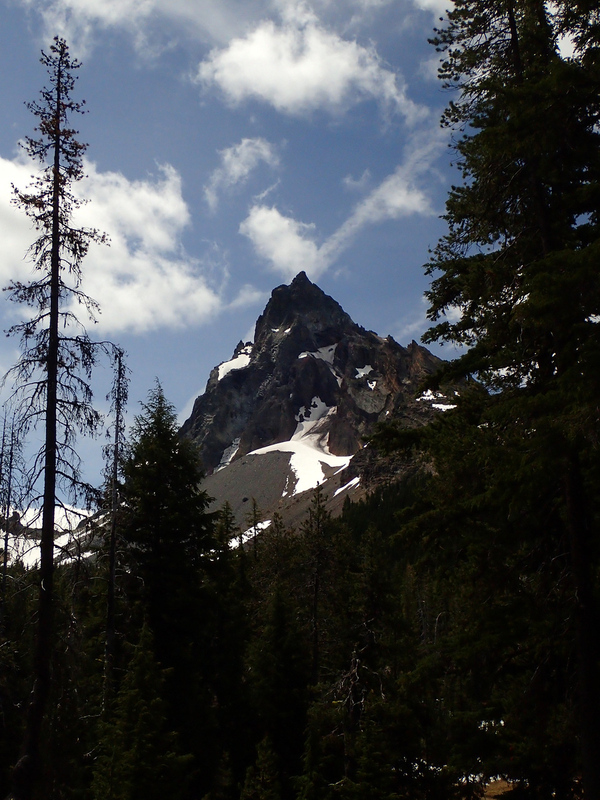 Elevations range from 5,000 feet to the 9,182 foot summit of Mount Thielsen. 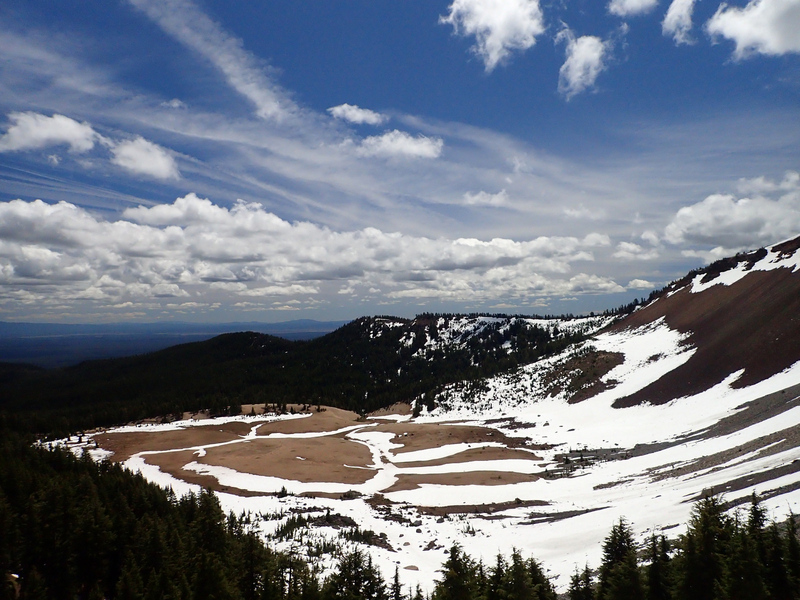 Born of the same volcanic activity that created Crater Lake, this is an area with a seriously tortured geology. 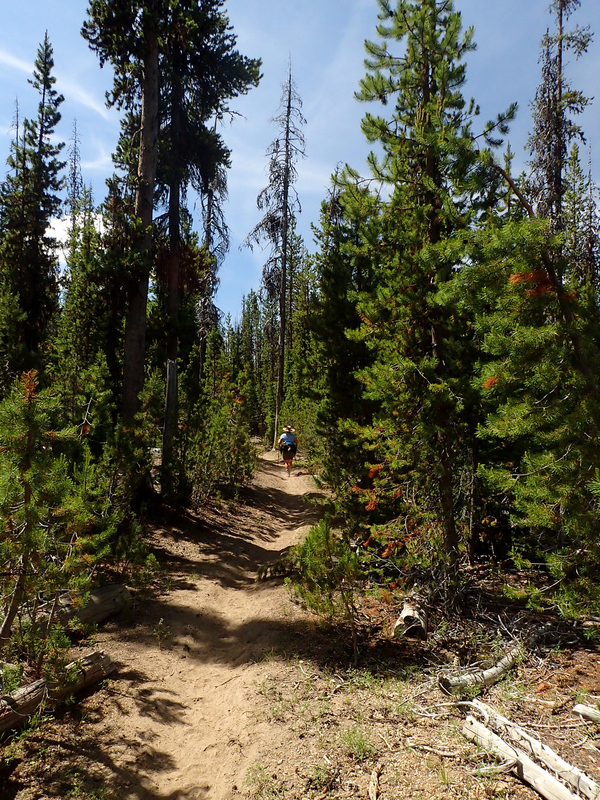 Last year, we did two hikes in this wilderness, one a loop from the Howlock Mountain trailhead (USFS), up the Howlock Mountain trail (USFS #1448) to the Thielsen Creek trail (USFS #1449) and up that to the Pacific Crest Trail (PCT). 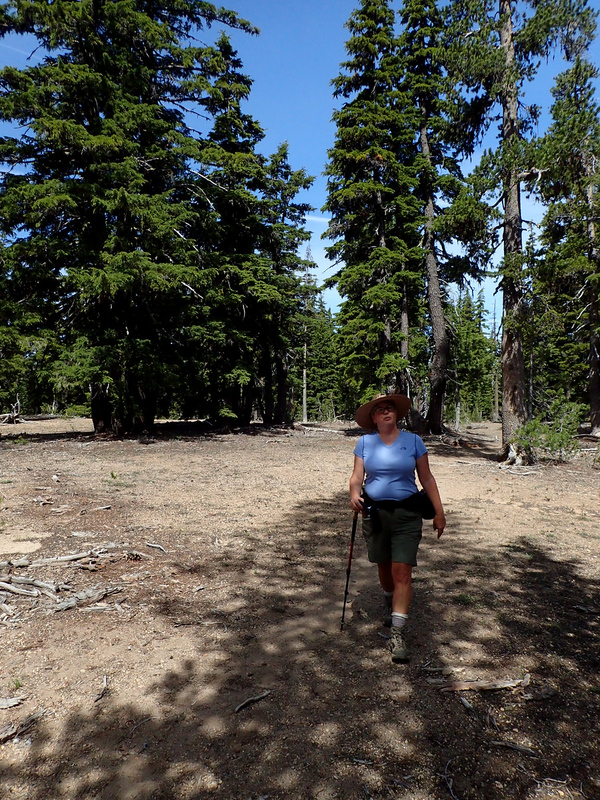 We then took the PCT south to the Mount Thielsen trail (USFS #1456), followed the #1456 west to its junction with the Sprague Ridge trail (USFS #1458) and took the #1458 back to the Howlock Mountain trail and the trailhead. 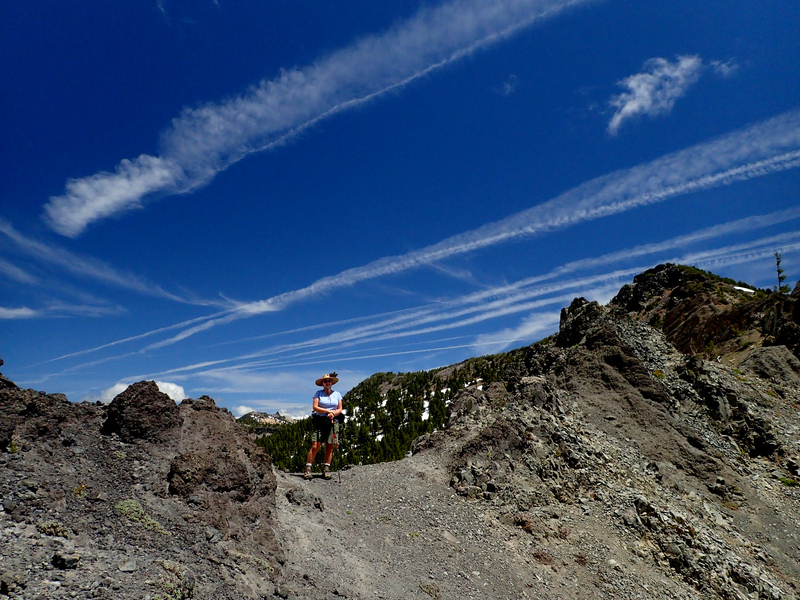 It was screaming hot that day, so this became known as the Beau Geste hike (post). About a month later (and on a much cooler day), I did a trail and cross-country hike to Tipsoo Peak (USFS #1472) and the eastern summit of Howlock Mountain, again using a piece of the PCT to make a loop (post). 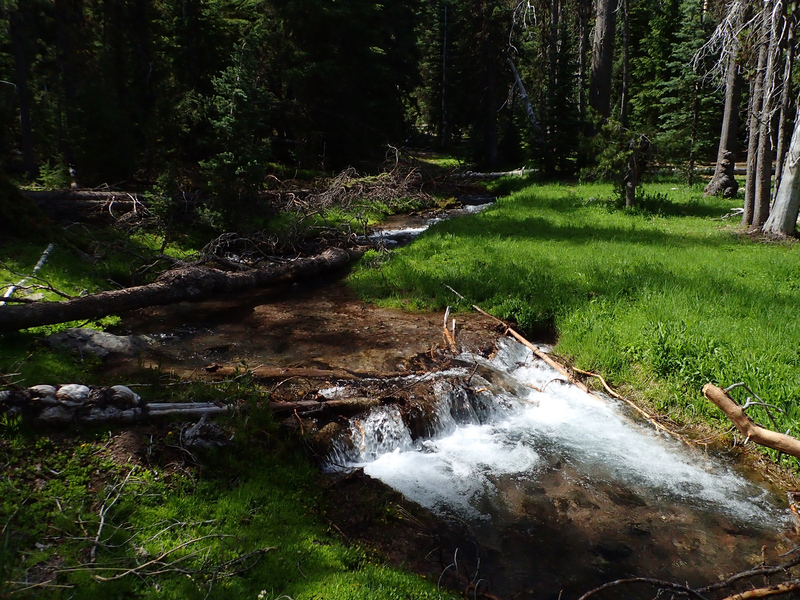 An upshot from this hike was a question about the spring (what we’re calling “Cottonwood Creek Spring” since it appears to be the source of Cottonwood Creek) in the large pumice basin immediately east of Mount Thielsen. 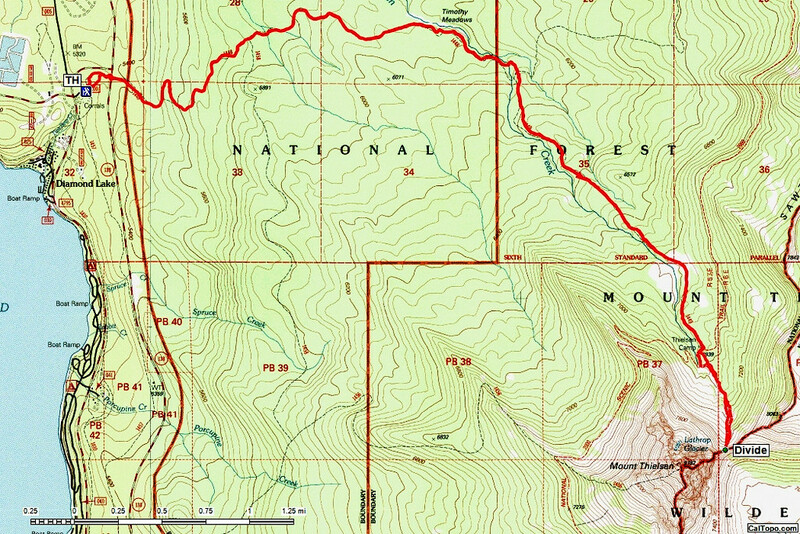 Based on what we learned on our previous hikes, it seemed we could get a closer look at this spring by going cross-country up canyon from where the PCT crosses Thielsen Creek at what the USGS topo map calls “Thielsen Camp.” And so we gave that idea a try today. 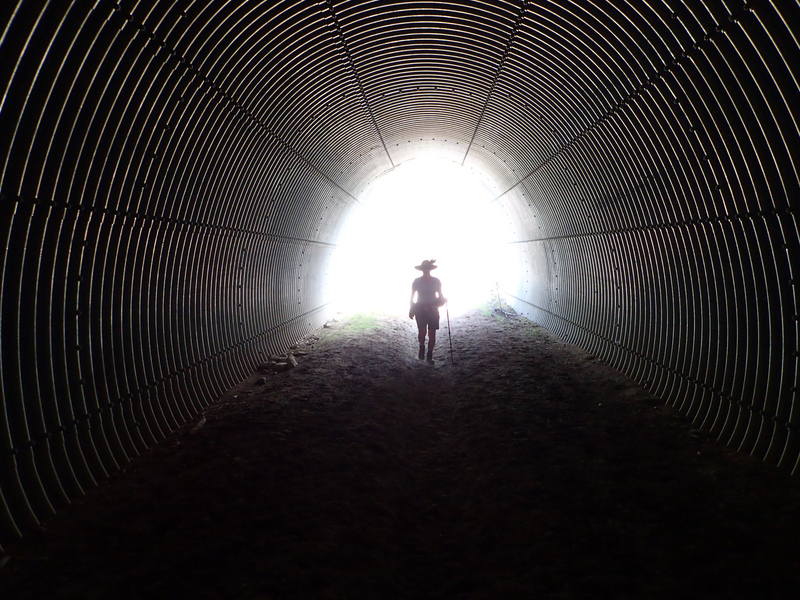 We started from the Howlock Mountain trailhead and went toward the light (so to speak) as we transited the people/horse tunnel under Highway 138.
for the 3.5 miles up to where the Howlock Mountain trail crosses Thielsen Creek and junctions with the Thielsen Creek trail. and we got our first close view of the convoluted prominence of Mount Thielsen. 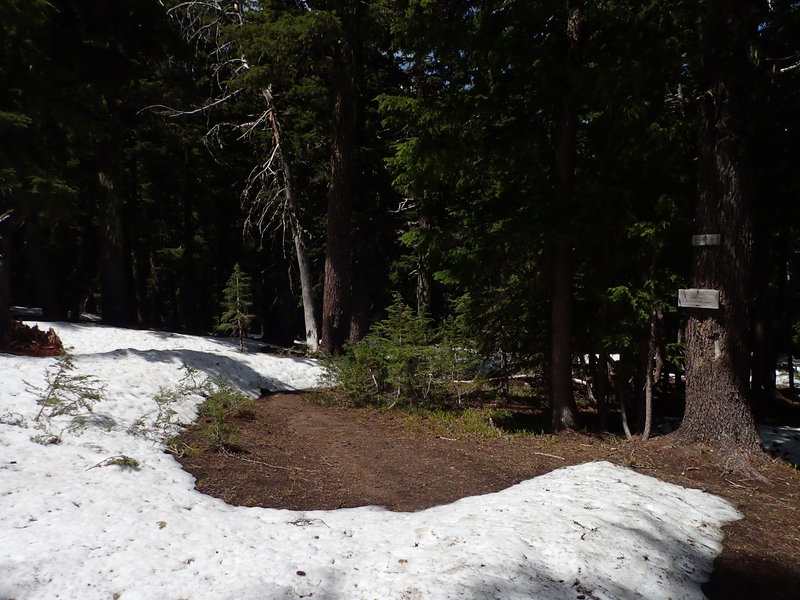 Unlike last year, when this area was seriously parched, this year we started encountering large snow patches around 7,000 feet – some 6 to 8 feet high! 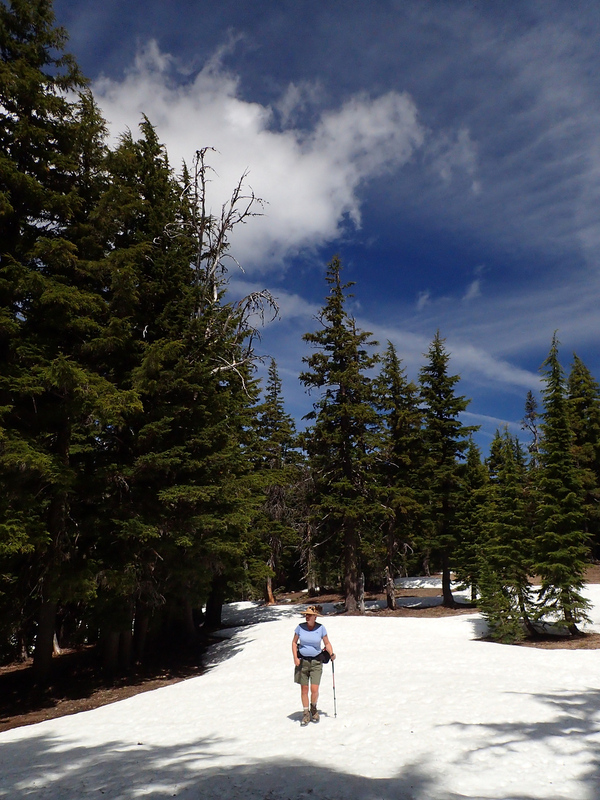 We saw some other hikers who were apparently turned back by this snow. 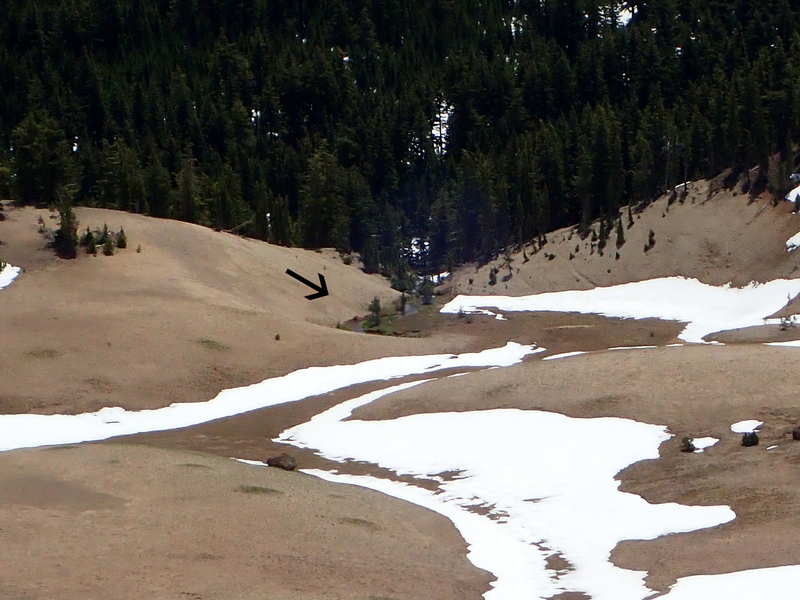 and, following the PCT south, we found it completely buried where it crosses Thielsen Creek. 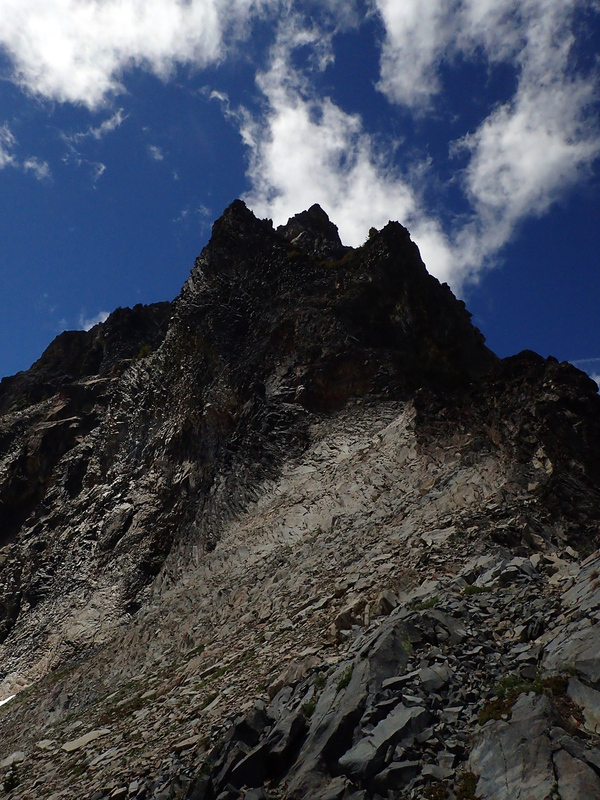 So we turned east here and made our way up the sandy slopes and through the forest on the north side of Thielsen Creek, aiming for the low point – what we’re calling the “Thielsen Creek Divide” – on the Sawtooth Ridge just north of Mount Thielsen. This proved to be pretty easy going, as the forest was fairly open and the sandy sections not too loose. 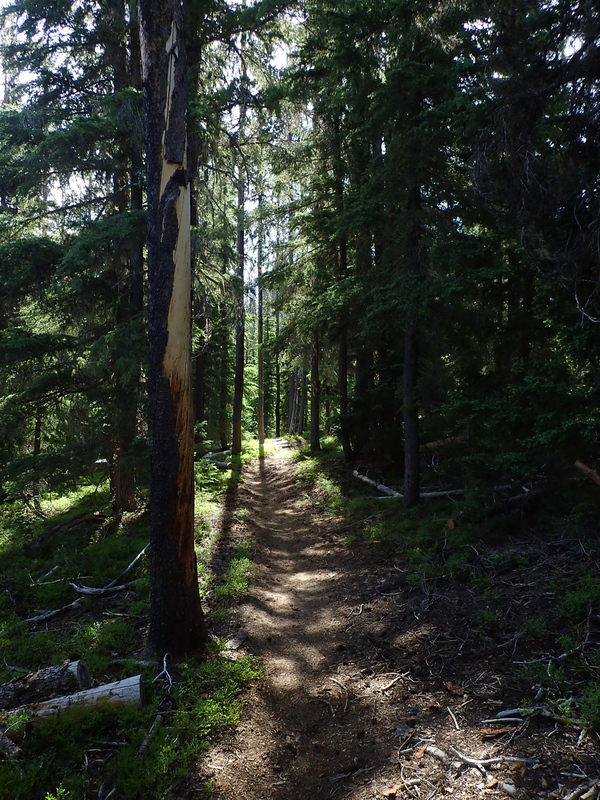 The slope was also not greater – and less so in places – than the Thielsen Creek trail itself. 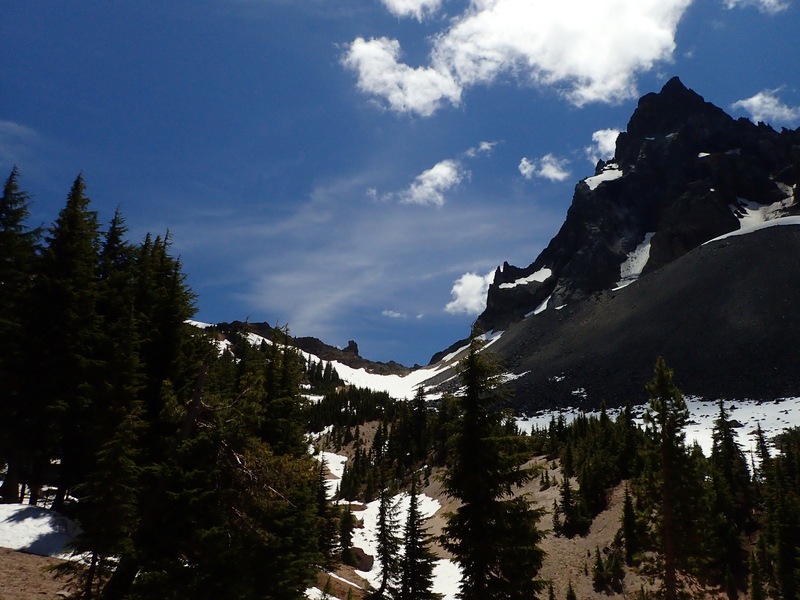 We made good progress as we passed below the looming bulk of Mount Thielsen. 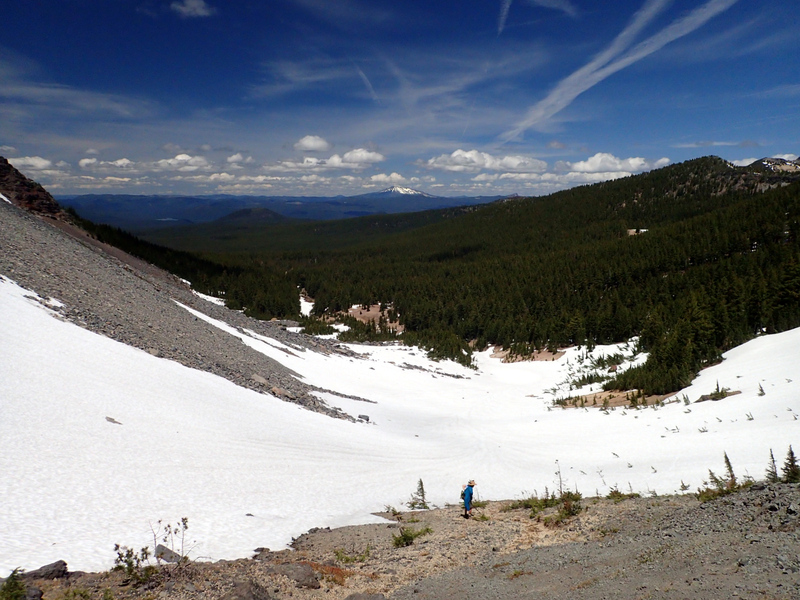 What’s left of the Lathrop Glacier is visible in the first notch right of the summit; its terminal moraine is evident as a rounded mound of boulders and gravel. 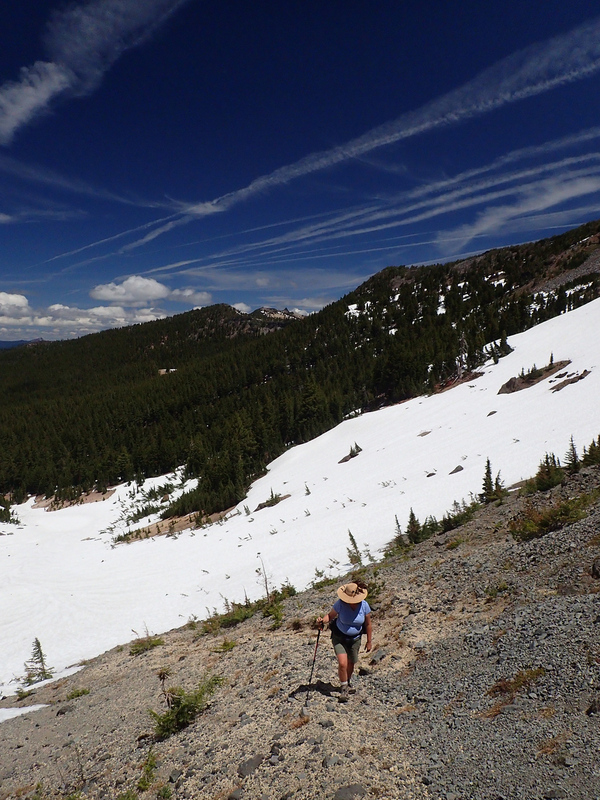 About halfway up the valley (which is the upper, eastern end of Thielsen Meadow), we ran out of forest and sand and had to move onto the snow. This turned out to be ideal Spring snow, soft enough for good footsteps but without any postholing. Again, the slope was gentle and the going easy. We’d been so focused on marching up the snow that we almost forgot to turn around and take in the amazing view to the west that was unfolding as we gained altitude. 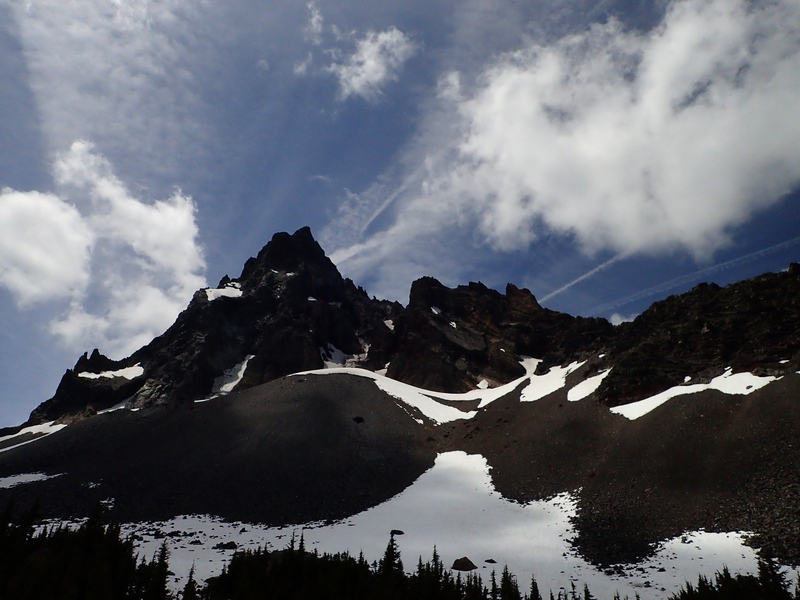 Soon we got high enough to see snow-enhanced Diamond Peak out to the northwest. 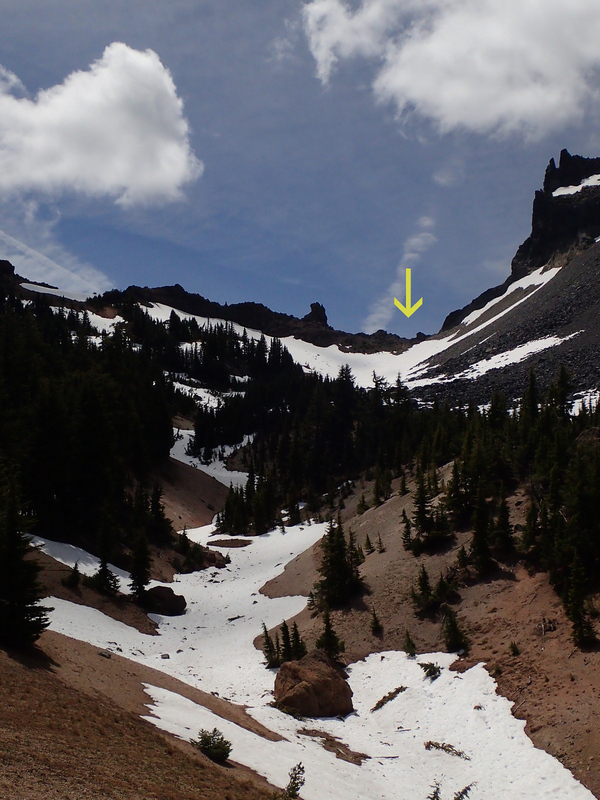 As we got higher, a use trail began to appear – we thought we’d seen it even lower down, between snow patches – suggesting that this is not an uncommon way to get to Thielsen’s east side. This way is certainly easier than going over the divide near Howlock. which we could just make out at the east end of the basin. 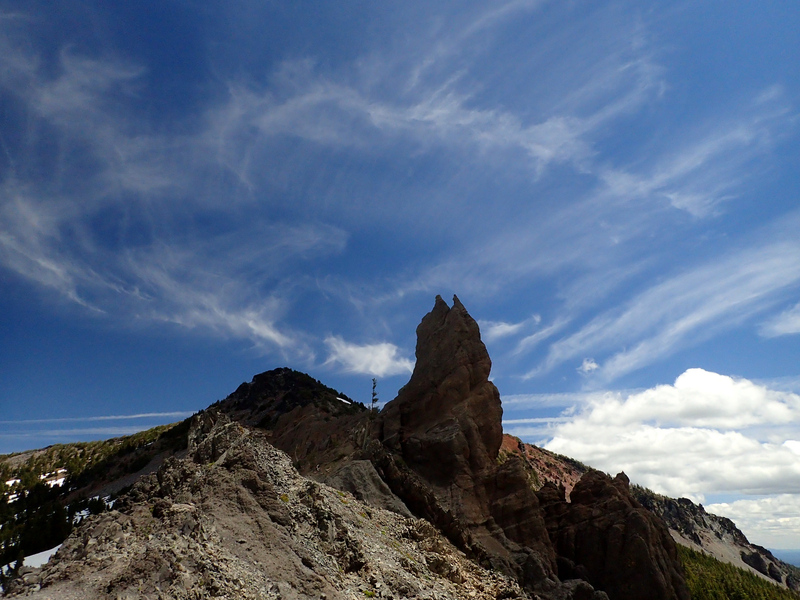 while Thielsen really loomed over us to the south. 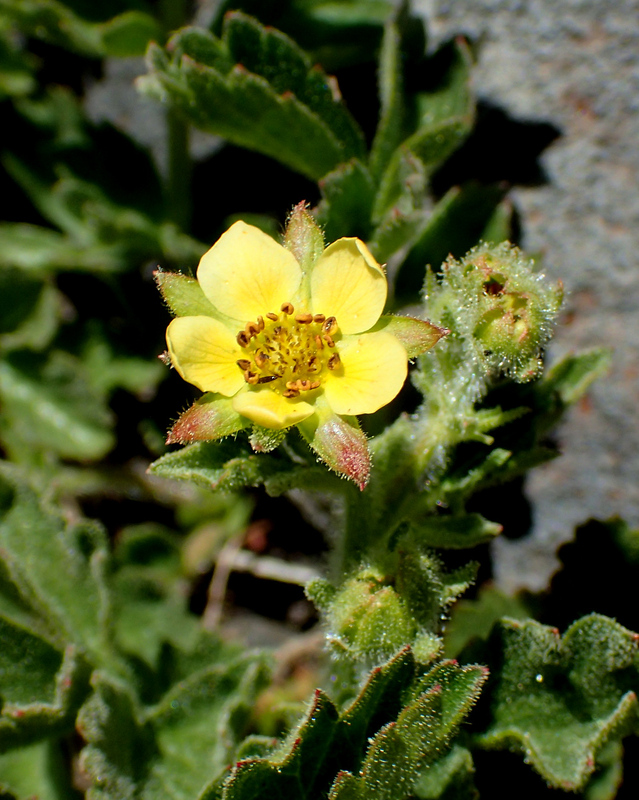 Spring had just started here a 7,400 feet and small flowers – like this Silky Cinquefoil – were starting to emerge even in this parched, sun and weather-blasted terrain. finding that the snow was the perfect consistency for very easy downhill travel. Much fun here. We were back at the PCT in no time. From there, the valley looks much more intimidating for cross-country travel than it is. 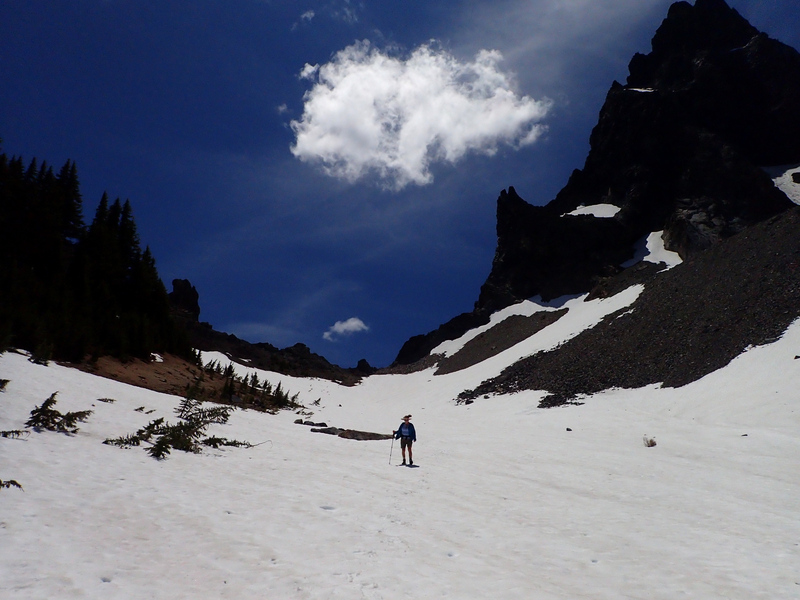 Even after the snow melts, it looks like you could get to the divide without having to deal with scree or boulder fields. 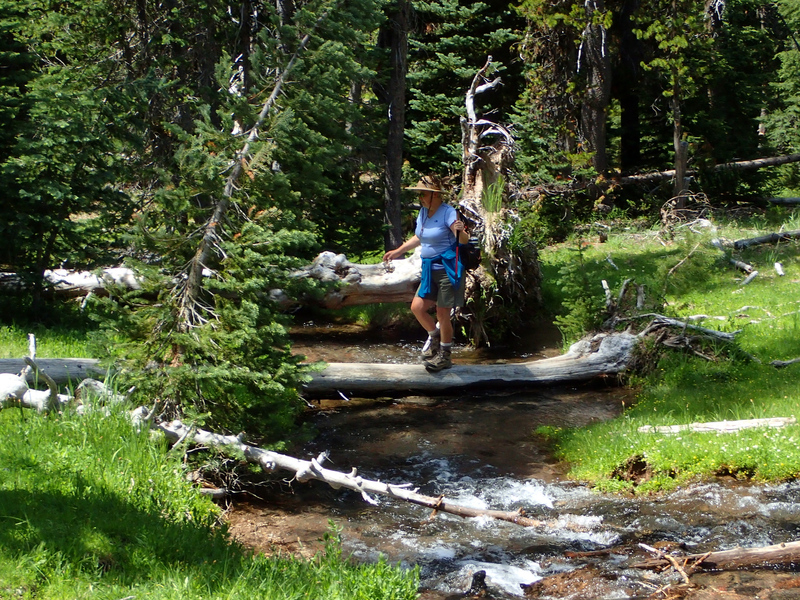 Hence a great destination for a dayhike, whether or not you want to push on to the spring. 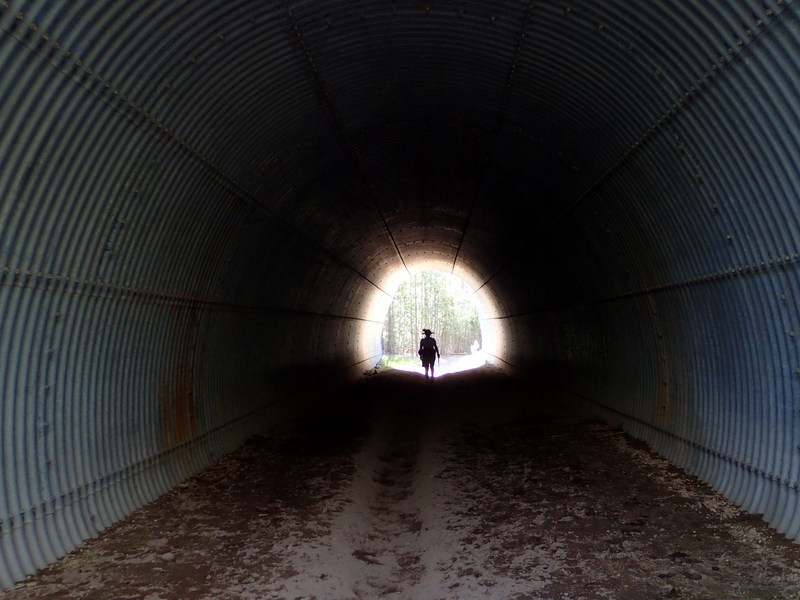 and through the tunnel to the trailhead. 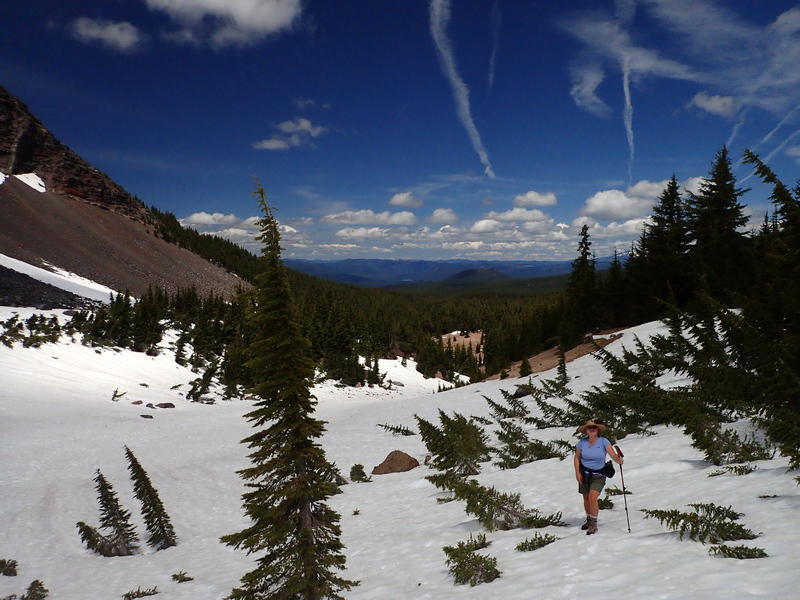 All in all, a most excellent hike (12.8 miles round-trip; 2,200 feet of elevation gain) with good trails, fun snow travel, expansive views of Diamond Peak to the west, and of Mount Thielsen right overhead (or so it seemed).